Billy Keppinger was a four year letterman at Parkview High School where he played outfield and first base. He played at the collegiate level before being drafted in the 17th round by the Kansas City Royals in 2000. Here, he was recognized for his pitching abilities and continued his success as a left handed pitcher, reaching AA level. 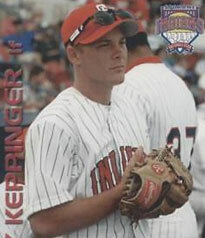 Billy then returned to Georgia where he focused his attention on helping his younger brother, Jeff Keppinger, succeed in the MLB. Additionally, he developed and coached a high school show case team. He now continues his decade plus experience of private instruction at Devine Baseball, utilizing his diverse experience as a utility player.